Whether you backpack alone or with companions, sometimes you run into the unexpected - something challenging, and maybe a bit dangerous. The important thing is to stay calm, think things through, rely on your experience, and make a plan. The worst thing you can do is panic - it prevents you from thinking straight, it increases your heart rate and breathing, and can cause you to rush to make a rash decision. Keep your head and use your common sense. If you made good preparations, then even if conditions changed more dramatically than anticipated, you can work your way out of the problem. I had such a situation a couple of years ago - first week of October 2013. 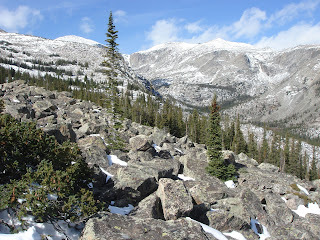 I was on a work trip to Wyoming and had made plans to tack on a side trip to the Bighorns. I planned for cold conditions, and packed appropriately. 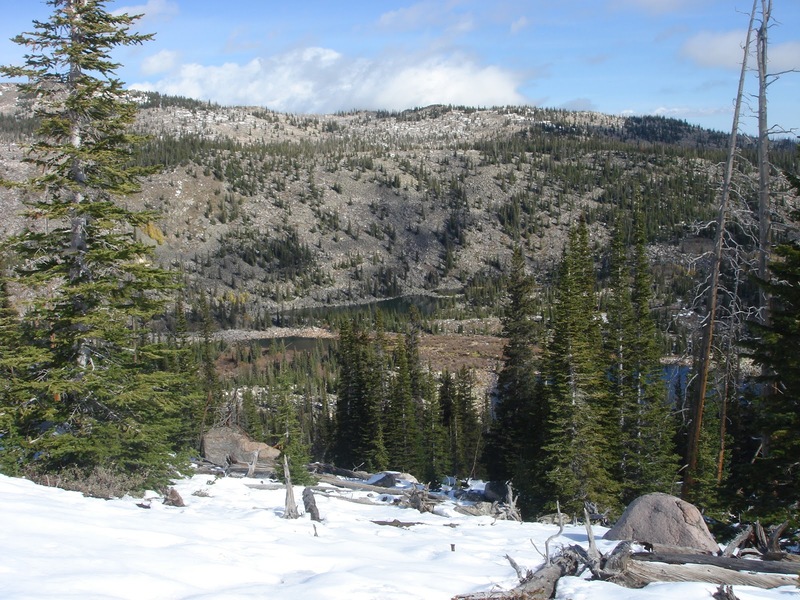 I tracked historical weather conditions and current conditions using the NOAA Snotel site - it said that snow usually starts accumulating in mid-October, so while the peaks might be snowed in, the lower elevations should be fine. A month out, the weather forecast looked favorable. Then, a week ahead of time, Wyoming got hit with about a foot of snow. 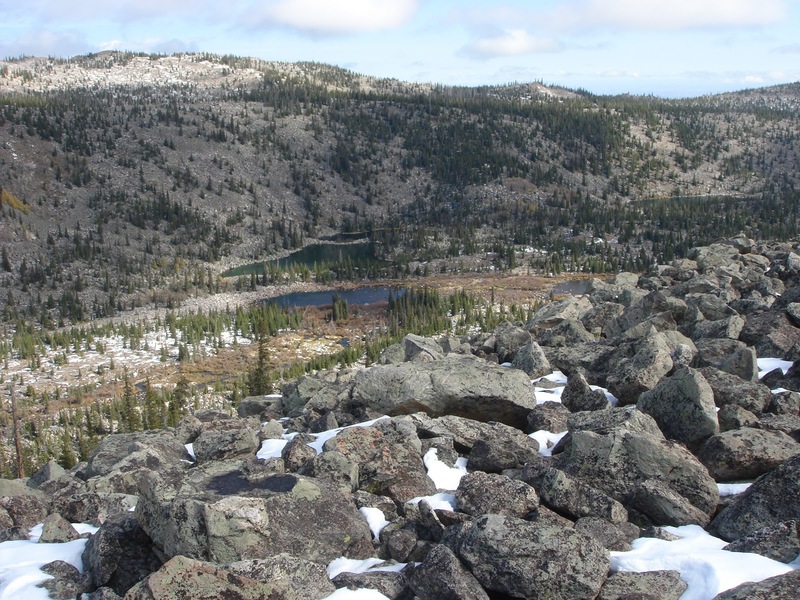 Each day thereafter, the Snotel site showed the snow cover decreasing by 2-3 inches, so I still felt okay about my plan - I just wouldn’t be able to get as high above treeline. As I flew out to Casper, the forecast was calling for a storm to hit the Saturday that I was to return home - good timing. In the two days before my planned outing, though, the forecast changed and called for the storm to hit earlier - rain and freezing-rain starting Thursday night then changing to snow on Friday, with several inches accumulation. Okay, I'm heading out on Tuesday, can hike all day Wednesday, and would head back to camp near the trailhead on Thursday for an early departure on Friday morning. That was the plan anyway. Wednesday morning started off beautifully - 65-degrees and sunny; not a cloud in the sky. By mid-day it was over 75-degrees and I didn’t start hitting the snow-line until about 10,500 feet…better than expected. 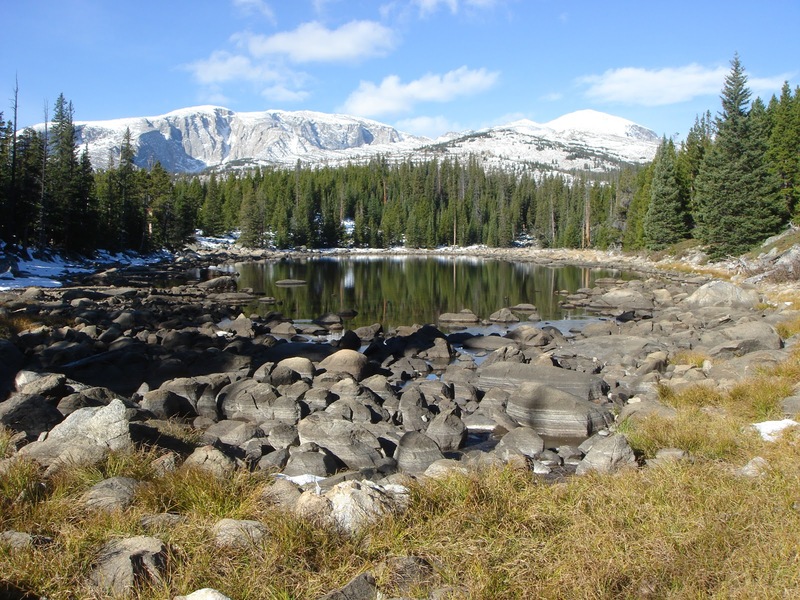 I plotted out a course to take me down to an isolated lake at around 9,500 feet to make camp. As the afternoon progressed, the clouds started rolling in and the temperature just kept dropping. I got to camp at about 5:00; and the temperature was hovering around freezing - about a 40-degree drop. No problem; I was set for temperatures down to about 0. I have my Spot GPS messenger, so people can find me if I run into too much trouble. No need to panic. My pyramid tent can hold up to snow; my sleeping gear is good down to near zero; and I have three days of food. 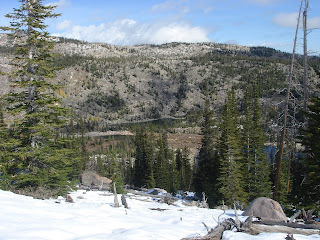 Even if the snow gets bad, I can hike out in the morning - I have a map and compass; I’m only about a mile from the trail; and maybe four miles from the trailhead. Okay…next thought - the rental car is not going to make it back to the main road if we get more than a few inches of snow. 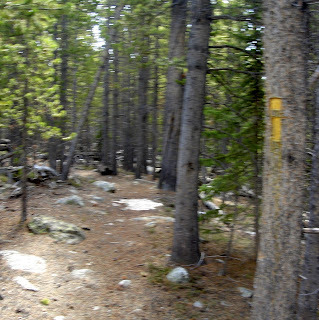 Also, to head back toward the trail, I will need to cross about 100 yards of boulder-field that is rapidly getting blanketed in snow - can you say broken leg. I didn’t bring snow shoes, so I’d either have to fabricate a pair out of pine boughs in the morning and hope the car can make it out, or I’d have to head out now while I still have some late daylight and only light snow cover. Let’s compromise for now…break down camp quickly; don my headlamp; and carefully cross the boulder field. If conditions continue to deteriorate, then I can make camp on the other side - closer to the trail. Good call. I made it across the field while I could make out all the boulders and they were not yet too slick or iced over. I actually made it to the trail in about 30 minutes, before I lost all daylight. The snow just kept getting heavier. The trail was mostly obscured by what was now about 3 inches of fluffy snow. 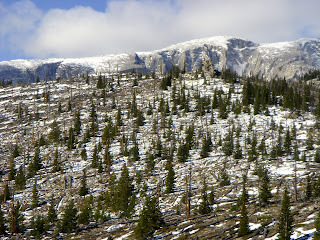 To make matters worse, the trail blazes in Cloud Peak Wilderness are not reflective - they are just scalped bark off of the pine tree trunks, which are not easy to see by light of headlamp in a snow squall. 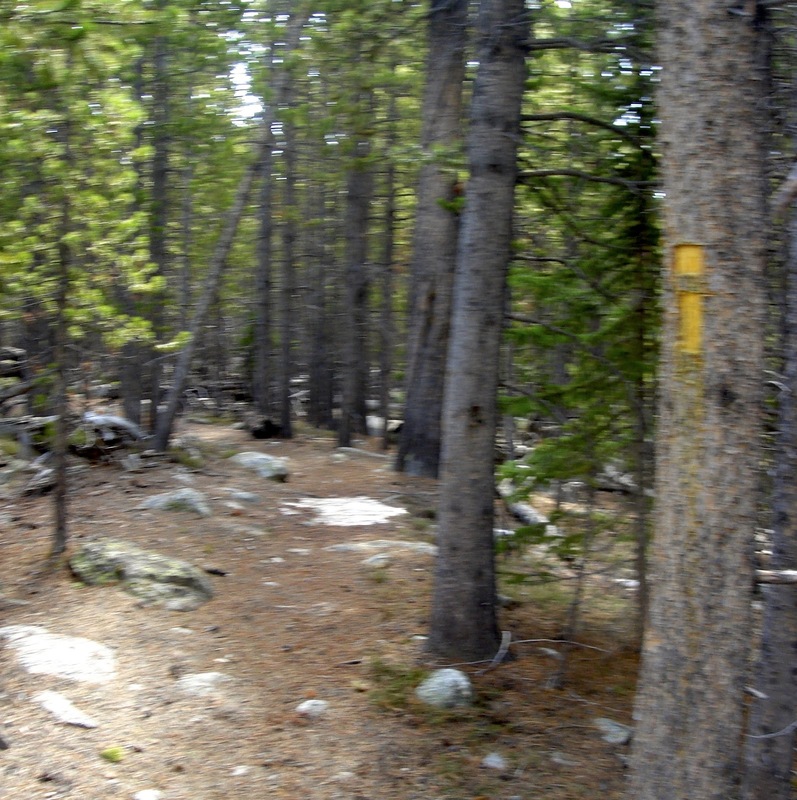 I decided that I would give myself about two hours to try and follow the trail the final three miles out; and if it was too hard to follow or taking too long, then I’d just make camp. I could always hike the entire way back to the town of Buffalo over the course of two days even if Rt 16 were closed down… but I might miss my flight on Saturday. I never thought I was a very good tracker until that trip. As I worked my way back toward the trailhead, I found that I could make out disturbances in the way the snow covered the ground along the path, spy broken branches, see where there was stunted scrub brush from being trampled, and I only had to confirm I was on the right track with the occasional blaze marks. A couple of times, when I hadn’t seen a blaze for a while, I backtracked along my own trail until I verified I was correct. By 9:00, I was at the trailhead, and feeling pretty good about myself. I never panicked; I considered my options; made a plan and a backup; and kept re-considering the situation. The rental Chevy Sonic even did a fair job of making it through the 4-inches of snow along the access road and back to Rt 16. By 10:00, I was back in Buffalo and grabbed a well-deserved beer before checking into a hotel. As it turned out, the forecasts were way wrong. There was over a foot snow accumulation overnight from Wednesday to Thursday; and as I drove back to Casper on Thursday morning, Rt 25 was being closed behind me. By Thursday night, all of central WY had 2+ feet of snow, and the airport was shut-down until Saturday. It just goes to show that even with all the right planning and preparation, the unexpected can still catch you - just don’t let it beat you. Keep your head, and your head will keep you.